We understand how important it is for you to feel comfortable and confident with every step of our journey together. 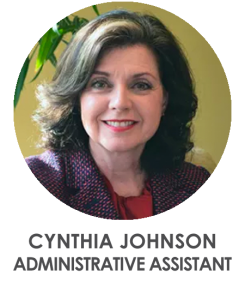 Whether it’s your call to our office or your arrival to schedule a review meeting, you’ll feel right at home with Cynthia’s warm and professional greeting. Working in conjunction with our support staff and wealth advisory team, Cynthia offers her helpful and cheerful spirit to ensure each and every detail of your experience with FAC is a delight. Cynthia and her husband, Greg, moved to Grand Rapids over 25 years ago and quickly found it to be a place of warm-hearted people and great natural beauty. She loves to hunt for new recipes and especially enjoys baking bread. She is most happy when she can get together around the table with their three daughters, son in laws, and grandchildren. She and Greg have a passion for convertible cars and take every opportunity to drive with the top down around West Michigan and beyond.